After looking through Sheldon Brown website on aerodynamics, it was stated that wearing an aero helmet could potentially save 47 seconds in a 40km time trial. I was rather intrigued by the fact that it is free speed simply by changing equipment! 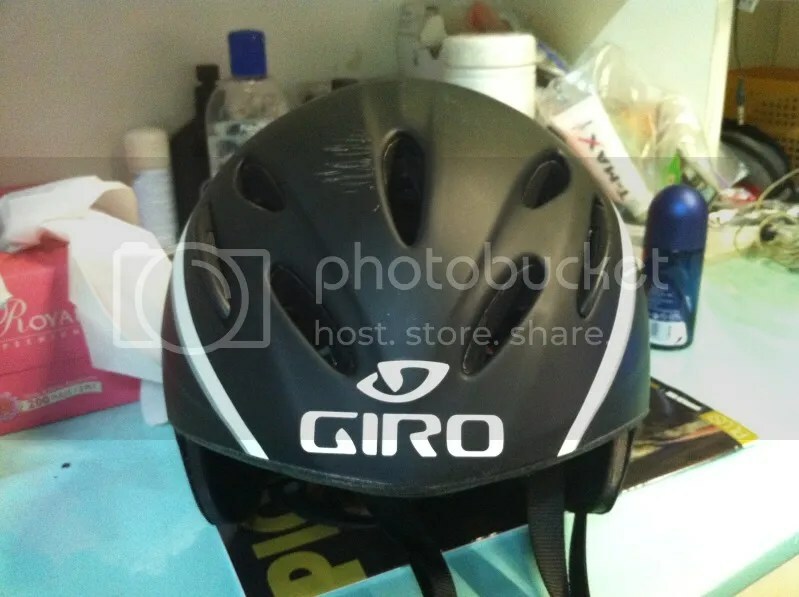 Aero Helmets are uncommon in Singapore strangely, even for those on TT bikes thus wearing one would make you stand out. Just for trying, I took the plunge and purchased a Giro Advantage from Chain Reaction Cycles. It came in about one and a half week and quickly took it out to test. It came in a box (not pictured) that was rather big for a helmet, ensuring that the helmet was well protected from its journey from the UK. Inside it contained the helmet,some stickers and the usual manuals complete with many disclaimers and waivers. 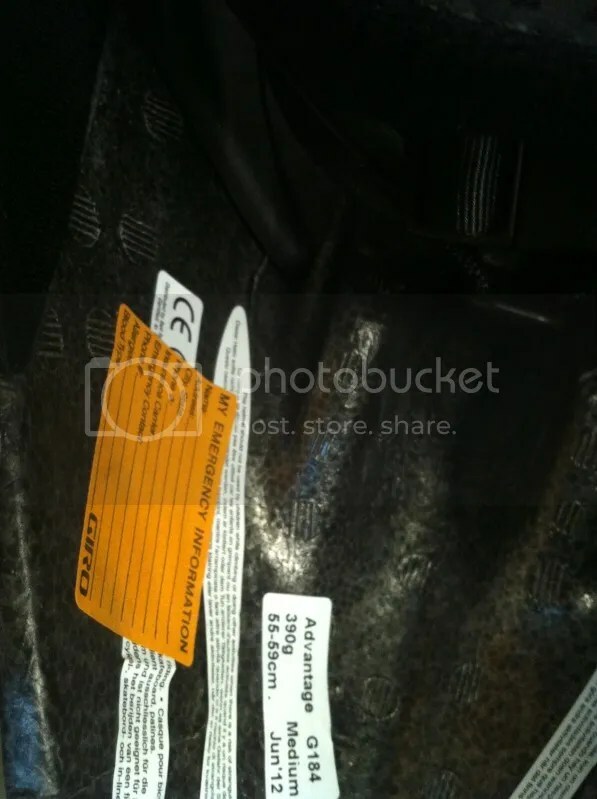 on paper, it was stated that it was 390g but it doesn’t feel that heavy even after coming from a sub 180g OGK helmet. It sure looked as cool as hell with the sharp tail end. 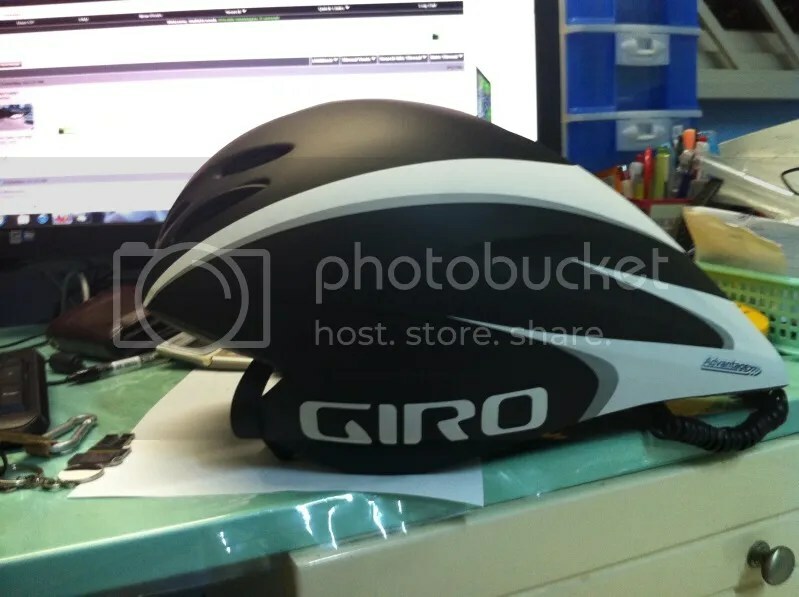 Though Giro has come out with the new helmet (The giro attack) which follows the kamm tail principle I believe, this still looks way cooler than that. 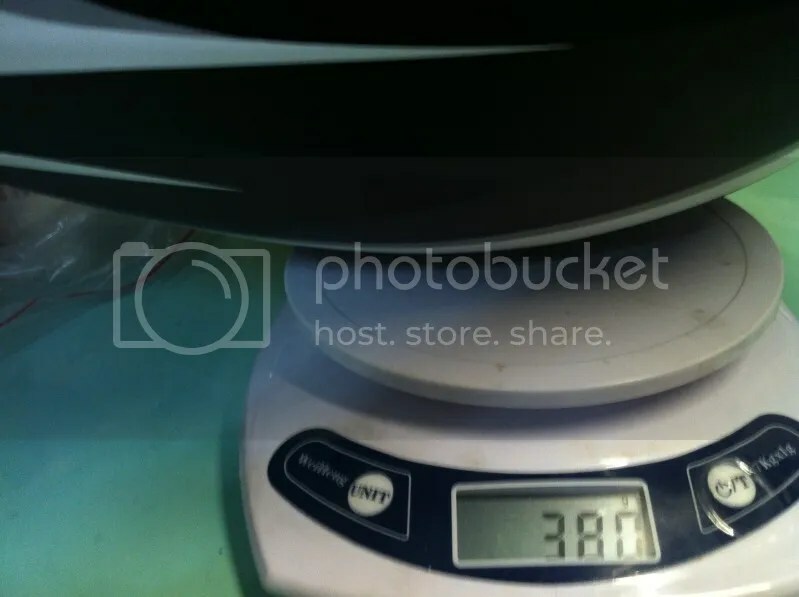 Claimed weight at size Medium is as stated 390 gram but upon weighing it with a scale, mine came im at 380gram which is slightly lighter(deviation of 3%) or so. Since this is my first time with an aero helmet, I do not know what is an average weight. However, compared to a road helmet, which comes with more vents and lesser material, one can see where the weight comes from. After looking at the helmet and wearing it around while not on the bike, I can feel how HOT the helmet is, with so little vents in the front(and none at the back) this is the helmet designed purely for aerodynamics in mind.It compromises mainly of Styrofoam fitted with a plastic shell over it and the strap system. Fitting was okay, not too tight and am able to fit the helmet without any compromise in comfort. More on how i got that scratches later. But here is the frontal view of the colour. I must say though even though the Black/White White/Black scheme is overused, it does look kind of cool. Having done a 20km run in the night and done a 110km bike ride in the morning, I was not in a very sane state of mind when my friend invited me for a ride at night. Joined the usual group and started out at the back. Slowly increased my speed when I reached Changi Coast Road and started to bolt off like a rocket. I must say that (be it a placebo effect)I find it easy to maintain 37-38kph even without much rest in the afternoon. However once at the rest point with the helmet taken off, I looked like I just came out of a shower with the entire body wet and the brain abit overheated from the ride. Still. i believe that it is more aerodynamic as compared to the other helmets. On the way home, I crashed my bike after somehow leaning too much to the left and it scratched my brand new, not even 1 ride helmet. Since this is my first foray into aero helmet, I have no major complains other than it being super hot.